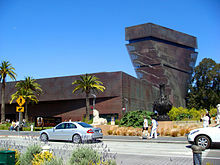 The Fine Arts Museums of San Francisco, comprising the de Young Museum in Golden Gate Park and the Legion of Honor in Lincoln Park, is the largest public arts institution in the city of San Francisco. The permanent collection of the Fine Arts Museums, with about 150,000 objects, is organized into nine areas, each with a curatorial staff. Unlike most other major art museums, the Fine Arts Museums of San Francisco do not have a large endowment from which to draw. The museums operate on an annual budget funded by membership dues, ticket sales, donations (from philanthropy and grants) and purchases in its stores. They are run in a private-public partnership with the city of San Francisco, which owns the two museum buildings and covers about 23 percent of their operating expenses by providing security guards and paying insurance premiums. In 2016, the two museums drew a combined 1,402,000 visitors. In 2012, the Fine Arts Museums of San Francisco and the Louvre signed an agreement that provides for collaborative exhibitions and the sharing of art works. The agreement has a duration of five years. It creates a partnership to promote short- and long-term loans art works that allow the works to be seen in both cities, joint publications, art conservation projects and educational programs. Thomas P. Campbell became director of the Fine Arts Museums on November 1, 2018. ^ ""Visitor Figures 2016"" (PDF). The Art Newspaper Review. April 2017. p. 14. Retrieved March 23, 2018.